Are you struggling to motivate your team in MLM? Motivating your team can be an exhausting task! The truth is that if you want a team that produces consistently, you have to do that yourself first! Be an example. Imagine if you didn’t produce at all and tried to motivate your MLM team? Why would they listen to you? Think about how you would feel if your sponsor had expectations of you but was not producing anything? You probably wouldn’t listen to them either, would you? 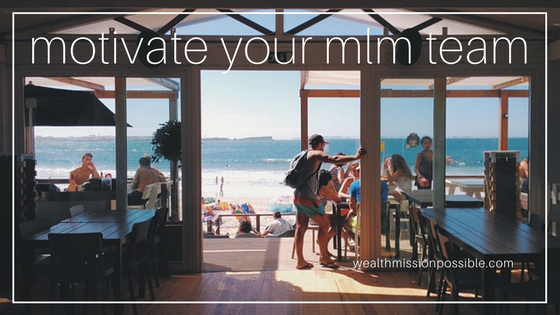 In this article I share some smart ways to energize your MLM team and teach them how to motivate from within. Motivation is interesting. Have you ever been to an amazing business conference. Everyone leaves the conference fired up, filled with intense motivation. BUT … it’s a feeling that wears off after a time. Once it does, how does a person get it back? That’s where inspiration kicks in. True motivation comes from within. When your network marketing team is inspired to create a life of financial freedom or whatever it is they desire in life, then they will produce. Be a good leader. Show people that you believe in them and their vision for their life. Help give them the confidence to step into and work towards the future of their dreams. If you have an MLM team that does nothing and has consistently done NOTHING, it’s time to start a new team. This actually happened to me. I was working hard to motivate these people but over time, there were no real producers on my team. One day I finally realized that putting my time and energy into that group of people was not a good use of my time. I started over. This helped change the dynamic, forced me to recruit more people, and help people who really wanted to realize their dreams instead of just wishing for it. Helps me to sort through who is serious and who is not by the action they take (or NOT). Helps the new distributor who may not be used to working on their own, thus they need assignments. Helps your team see that they can accomplish small tasks that soon add up to BIG success. Instead of struggling to motivate your team in MLM, inspire them to believe in themselves and have the confidence to accomplish their goals. Then you can motivate them in a variety of ways that I’ve mentioned here. I hope that this helped you in some way. If you know someone who can benefit from this post, please do share. For even more helpful information about growing a successful MLM business, click here.